Disney's $250 million fantasy epic opened at a soft $30.1 million domestically. "John Carter" opened to bad box office — and a robust challenge from reigning champion "The Lorax." Walt Disney Studios' Martian action-adventure film "John Carter" was flagged many moons ago as a potentially catastrophic box office flop. 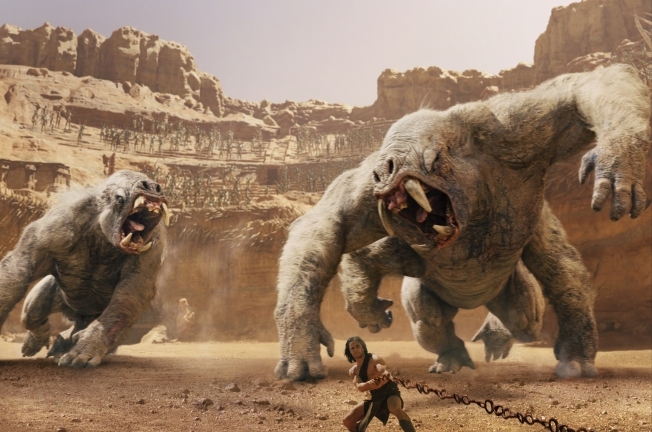 Although the $250 million mega-budget fantasy epic nabbed some decent reviews and exceeded expectations internationally, the doomsday prophecies about the film's domestic financial prospects have been fulfilled: "John Carter" opened at $9.8 million on Friday and is set to earn approximately $30.1 million domestically for the weekend, according to the Hollywood Reporter— paltry sums for a high-profile project speculated to be one of the most expensive films in Hollywood history. According to the Los Angeles Times, Disney stands to lose between $100 million to $165 million on "John Carter," a long-in-production adaptation of Edgar Rice Burroughs' classic science-fiction series "Barsoom" starring "Friday Night Lights" star Taylor Kitsch as the eponymous interstellar hero. The film's $250 million budget places it somewhere in the top ten most costly American film productions of all-time, according to The Numbers. Universal and Illumination Entertainment's "Dr. Seuss' The Lorax," a family-friendly adaptation of the iconic 1971 children's book, will win the weekend with $40 million and earn an auspicious spot at the top of the 2012 box office chart. For point of comparison, "The Lorax" cost a relatively modest $70 million to make, according to Entertainment Weekly. Disney packaged "John Carter" as an effects-ladden spectacle on par with "Avatar" and "Star Wars" — two Hollywood behemoths, both prominently name-dropped in the studio-produced TV spots and tweets, with wide appeal to the coveted young male demographic. But the 3D would-be blockbuster was beset from the outset with a range of handicaps that threatened widespread commercial appeal, including Kitsch's low name recognition and a head-scratchingly generic title. "John Carter" reportedly also exceeded its massive budget and necessitated expensive late-in-the-game reshoots, The Wrap reported. (Stanton's inexperience with large-scale production — "John Carter" is the director's first live-action feature — may have also contributed to the film's poor reception). The film is not the first mega-budget Hollywood spectacle to crash and burn at the U.S. box office. "Waterworld" ($252 million) and "Wild Wild West" ($224 million), to cite two recent examples, were enormous commercial failures — and, like "John Carter," blended science-fiction with action-adventure to dubious results. Like Disney's 2010 sword-and-sorcery film "Prince of Persia: The Sands of Time," starring Jake Gyllenhaal in the title role, "John Carter" may offset a middling domestic run with international success. According to the Los Angeles Times, "John Carter" opened to strong sales in Russia, raking in $6.5 million — the biggest opening-day tally in Russian film history. According to the Hollywood Reporter, however, "John Carter" may not even be a sure-thing across all overseas markets: Early audience response in Asia and throughout Europe is apparently tepid.